Amazon’s Zappos, world nr 1 shoe retailer - What's going on in Retailing?! Amazon’s Zappos is a darling of the marketing industry for its progressive approach to brand building and it’s 24/7 superior customer service to their 24 million customers. Zappos is seeing from their sales, analytics and data that Mobile is growing at an explosive rate. As head of mobile at Amazon’s Zappos.com, Aki Iida wants to continue to find ways for the World nr.1 shoe – and apparel – retailer to be front of mind for shoppers. “Mobile” definitely extends the day. So the long weekends and holidays, which can sometimes be slower days, are complemented now by mobile. The online shoe retailer devotes separate teams for iOS, Android and mobile Web to ensure that each platform gets the distinctive attention it deserves. Many brands view mobile Web as more of an afterthought, but the reality is that new customers will first see a mobile site before taking the time to download an app, according to keynote speaker Aki. Mobile offers features that PCs don’t, so we would like to continue to innovate with those features. For example, last year we looked at how a lot of people are using their smartphones and tablets to interact with social media. 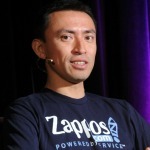 Hear what makes Zappos Mobile Strategy so successful during the What’s going on in (R)etailing? !’s Mobile Boot Camp in the morning of April 8th in the Amsterdam Arena. Followed by the conference in the afternoon where Aki Iida will tell how you can develop and implement a mobile strategy and tie it in with your overall retail business and marketing strategy.